A former Maybole woman was awarded an MBE in the New Year's Honours. 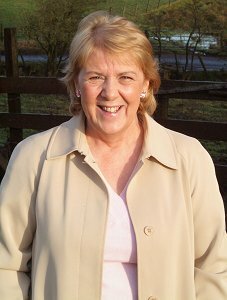 Ann Coleman, 56, was honoured for services to environmental justice and to the community of Greengairs, Lanarkshire. Ann Clark, as she was then, moved to Fineview Place, Maybole from Minishant when she was 3 years old. She attended Cairn Primary and then Carrick Academy and her first job on leaving school was in the bottom co-op grocery store. She then went to Ayr to work for a few years before returning to work in Jersey Kapwood and then Callaghan's. She got married in 1970 and left Maybole in 1971 for the bright lights of Chapelhall in Lanarkshire. Ann says, "The summers were awful to begin with, I missed not being able to get on my bike when I finished work and cycle to the shore, it was difficult getting used to the more industrialised environment as opposed to the clean air and countryside views that we enjoyed in Maybole. Through time I moved from Chapelhall to Glenmavis and then in 1994 to Greengairs where I now live on a small farm with my husband who breeds Highland Cattle for a hobby. Ann's mum still lives in Maybole, one of her brother's was a local "bobby" before moving to live and work in Ayr, her other brother now works with the Met Office in Aberdeen having started his career in Prestwick. Ann has three children and four grandchildren spread out through the UK in Crawley, Watford and Newcastle and she says, "they are my most important priority. My husband and I work together in our own small family business providing services mainly to the food industry." She became involved in the community when a public notice appeared in the local paper to extract coal by opencast on two farms about half a mile along the road. "I couldn't believe that anyone would want to rip up green farmland for an opencast," she says, "my upbringing in the idyll of Maybole with its surrounding fields and hills creating a very pleasant vista didn't prepare me for what was to follow. We fought the application right through a Public Inquiry but lost - when they started to rip up the fields I had to use the other road to town. I couldn't stand seeing the huge gaping holes in what had been green fields and the mountains of ripped up soil and rock piled high enough to be seen for miles around . It's not as if the village hadn't suffered enough there were already three operational landfill sites, including the largest landfill in Europe, two completed landfills and one of the largest opencast operations in the UK, all to the south of the village. I started asking questions about how this could happen in one small area, I talked to Local Authority Planning officials, Scottish Executive officials, Politicians and Friends of the Earth." Ann progressed to being one of the first group of students in Europe to gain a Certificate of Higher Education in Environmental Justice through Friends of the Earth and Queen Margaret University College in Edinburgh. She wanted to be able get the voice of communities over to those who make the decisions that result in planning injustices. And when she got the opportunity to give evidence to one of the Scottish Parliament Committees she had the knowledge and the confidence to give evidence that resulted in changes to a Planning Policy. Since then she has worked with Friends of the Earth and the Scottish Executive on changes to the Planning System. She has made presentations at conferences, given evidence to the Scottish Parliament and lobbied Ministers while fighting other battles locally as a member of the Community Council, including an application for yet another landfill. Ann adds, "Our relationship with the largest landfill operator has moved on and we now work together to reduce the impacts on the local community. We are even working together on regeneration projects that will benefit the area and return most of the land to green belt with public access and recreation areas - but there is still a long way to go yet." She was delighted to be awarded an MBE and says she feels very privileged to be a standard bearer for Environmental Justice and the community of Greengairs. generations. It isn't just about hugging trees - it's about hugging people too."